Recorded in many spellings some quite rare and including Albon, Alban, Albone, Allbon, Allbones, Alabone, Allebone, Alliban, Alliband, Allibon, Allibone, and others, this is an English medieval surname. It originates from the Roman (Latin) name "Albanus", originally an ethnic name from the many places in Italy, called Alba meaning white. 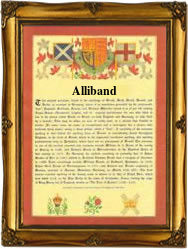 In England the given name was bestowed chiefly in honour of St. Alban, the first British martyr (3rd century a.d). The surname dates back to the 13th century and early recordings include Adam Albon in the Subsidy Tax rolls of Worcestershire in 1275; Hugh Alybon in the Coram Rege rolls of Derbyshire in 1297; and William Alybone in the Register of the Freemen of the city of York in 1345. Recordings from surviving early church registers in the city of London include the christening of Alce Allibone on July 17th 1547, at St. Peter's, Westcheap, and the marriage of Annes Allybone and Roberte Averyn on January 18th 1573, at St. Margaret's, Westminster. An interesting namebearer, recorded in the "Dictionary of National Biography", was Sir Richard Allibone (1636 - 1688). He was knighted in 1686, and became serjeant-at-law and justice of the Kings Bench in 1687. The first recorded spelling of the family name is shown to be that of Waltor Albon. This was dated 1250, in the Liber Feodorum register of Buckinghamshire, during the reign of King Henry 111rd, 1216 - 1272. Throughout the centuries, surnames in every country have continued to "develop" often leading to astonishing variants of the original spelling.